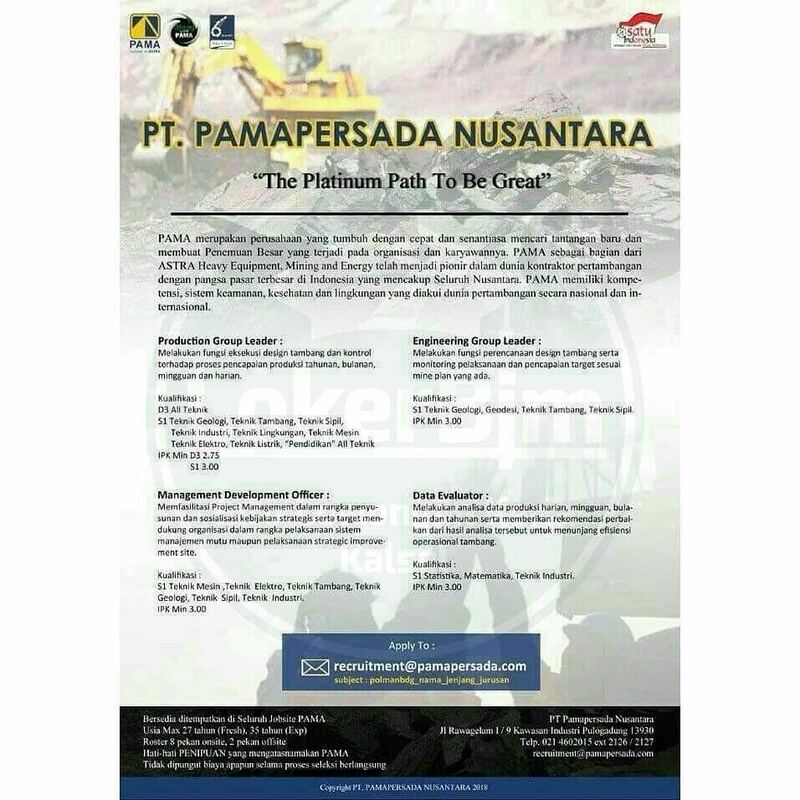 PT Pamapersada Nusantara - PAMA is a leading mining company in Indonesia with core competencies in coal mining contracting services. PAMA engaged in providing comprehensive and quality mining services. Its business include mine design, exploration, extraction, hauling, barging and transporting commodities. PAMA widely known nationwide as largest coal mining contractors in Indonesia as its controls about 48% of local revenue market share. 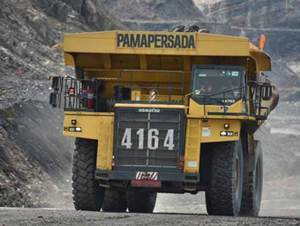 PT Pamapersada Nusantara is a member of Astra Heavy Equipment and Mining Group (Astra Group). PT Pamapersada Nusantara is a directly-owned subsidiary company of PT United Tractors Tbk (UNTR), one of the largest heavy equipment and mining companies in Indonesia which is majority owned by Astra Group. As of December 2016, PT Pamapersada Nusantara is 99.99% owned by UNTR, and 0.01% remaining shares by PT United Tractors Pandu Engineering (UTPE). Based in Jakarta, PAMA now has 3 subsidiaries; PT Kalimantan Prima Persada, PT Pama Indo Mining, and PT Multi Prima Universal. PT Pamapersada Nusantara managed to record total net revenue of Rp 24 trillion in 2016. This number is down 21% from the previous year of Rp 30.5 trillion, according to PT United Tractors Tbk Annual Report 2016 as cited by JobsCDC.com. Referring to its annual report, total overburden removal was down by 8% from 766.6 million bcm in 2015 to 701.5 million bcm in 2016. Total coal production in 2016 was 109.2 million tons or similar with the previous year. D3 Accounting, Taxation or S1 Accounting. D3 Informatics Engineering, Electro Engineering, Computer Engineering, Informatics Management, Micro controller and Instrument or S1 Informatics Engineering, Information Systems and Statistics. D3 Electricity Engineering, Electro Engineering, Mechanical Engineering, Civil Engineering. D3 Electricity Engineering, Electro Engineering, Mechanical Engineering, Civil Engineering, Hospitality and Tourism. D3/S1 Electricity Engineering, Electro Engineering, Mechanical Engineering, Mechatronics Engineering, Instrumentation Engineering. D3 / S1 Mining Engineering, Geology Engineering, Civil Engineering and S1 "All Engineering". Willing to be placed in all PAMA Jobsite. Roster 8 weekend onsite, 2 weekend offsite. JobsCDC.com now available on android device. Download now on Google Play here. Please be aware of recruitment fraud. The entire stage of this selection process is free of charge. PT Pamapersada Nusantara - D3, S1 Officer, Group Leader PAMA Astra Group April 2018 will never ask for fees or upfront payments for any purposes during the recruitment process such as transportation and accommodation.